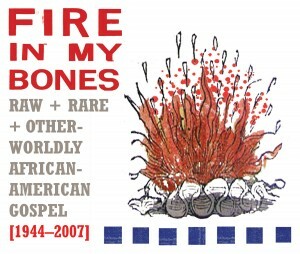 “Fire In My Bones provides a small peek at the incredible diversity and power of post-war black gospel. Much of this music is raw, distorted and might sound a bit strange. But it is not presented as a novelty freak show or as ‘outsider music.’ This is gospel –which we must always remember translates as ‘the good news’– as it has been sung and performed in tiny churches and large programs, from rural Georgia to urban Los Angeles. From the new three-disc box set Fire In My Bones, these songs remind me of the Alan Lomax recordings I heard when I had my musical fieldtrip to the Library of Congress, and the stack-scouring and re-releasing that Chicago’s Numero Group is doing. Fire In My Bones ignites just that; there is a depth of thirsty yearning and conviction in so many of these songs. This may sound weird, but if you’ve seen Avatar — listening to this music feels to me like how the creatures in Avatar can plug their central nervous system right into other beings, and sense all sorts of mysterious things outside their range of personal experience. These songs hit right at the visceral parts of me. The collection is out now on the Tompkins Square label (with one other mp3 available to sample for free). The box set has over four hours of previously-unreleased, rare gospel music, and part of the proceeds are benefiting musicians in New Orleans. thanks for the heads up…gotta git my mitts on this!